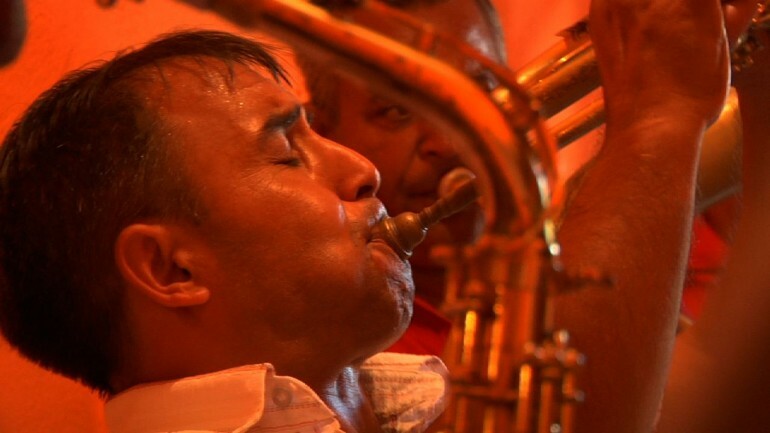 FILMMAKERS IN ATTENDANCE – A tiny Serbian village explodes with brass cacophony and riotous celebration as more than half a million music fans descend upon Guča, the world’s largest trumpet competition. Amidst a cast of defending Serbian champions and struggling Roma Gypsies, an unlikely brass band from New York City, Zlatne Uste, voyages to represent the United States only a decade after NATO bombs rocked Belgrade. They will be the first Americans ever to compete at Guča. In this war-scarred landscape, disparate societies find common ground in a joyous,deeply transcendent music that leaves no ear unaffected. BRASSLANDS bears witness to the deeper resonance of the music, as the town of Guča begins to swell with frenetic energy. From the deafening batteries of drums and staccato snares, to the euphoric brass chorales and electrifying trumpet solos, everyone here has gathered to celebrate the music, to dance, and to enjoy life. Despite the fact that tensions continue to simmer below the alcohol-fueled surface, BRASSLANDS attests to the fact that even amidst fractured ethnic and political divides, there remains a universal human desire for identity, joy and belonging—and that, if only for a few days, it will make itself heard.